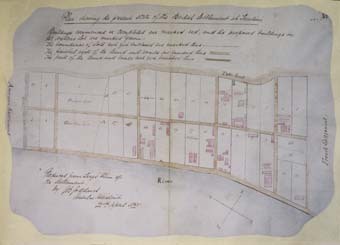 To introduce some kind of order to the expensive building programme that was clearly becoming necessary, and in which Parliament was increasingly taking an interest, the Treasury in 1866 sent Major William Crossman, a surveyor in the Royal Engineers, to Shanghai with a wide-ranging brief that covered all of the consular establishments in the Far East. Crossman was joined the following year by an assistant surveyor, Robert Henry Boyce, formerly a clerk of works in the Royal Engineer Department, a civil department of the Army. They travelled extensively and together they instituted exemplary systems for the effective planning, supervised construction, budgetary control and scheduled maintenance of the expanding programme of consulate buildings. At Shanghai, Crossman established a small and efficient regional works office, reporting direct to the Treasury. When he left China in 1869, Boyce succeeded him in charge of this office and, two years later, the Office of Works in London took over responsibility for it from the Treasury. Boyce remained in charge until 1876. 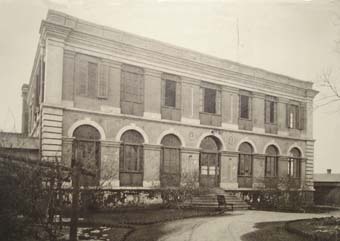 The office itself remained in Shanghai until after the Second World War. Of the 48 British consulates that were established in China, it was responsible for producing purpose-built buildings at 33 of them and for building maintenance at all of them. Crossman visited the 15 or so China consulates in his first year and reported his findings and recommendations to the Treasury, which almost invariably accepted them. He prioritised a programme of necessary buildings, and drew up outline designs for them. There was no exact format for the staffing of a consulate but most consisted of the consul, an assistant, a constable, an interpreter and a couple of Chinese clerks. The commonest accommodation requirement for a consulate was therefore a consul’s residence, including his own office; residential accommodation for the assistant and the interpreter, including with a small office and a courtroom; a quarter (as it was invariably called) for the constable, including a gaol with four or six cells for recalcitrants (most commonly drunken sailors); out-offices (as Boyce called them) for the clerks; and a tall flagstaff to signal the consulate’s location to incoming vessels. Nor was there a prescription about where a consulate should be located or how it should be designed. There was a clear operational advantage in its being within or close to a concession area, if such existed. Elsewhere, residence sites on high ground or at a little distance from the native cities were desirable for health and security reasons. If such sites were too inconvenient of access for those required or wishing to visit on business, the consular offices could be in separate accommodation close to the port facilities. Crossman and Boyce, and their successors, became highly conversant with the requirements of consuls through visiting so many of them and seeing what worked and what did not. They were both trained in the Royal Engineer tradition of simple plans, robust but economic construction, and an especial focus on designing against the spread of disease. This led them to variations of bungalow layouts, on one or two floors, generally built of brick, with wide verandas, and a relatively limited range of elevational treatment. 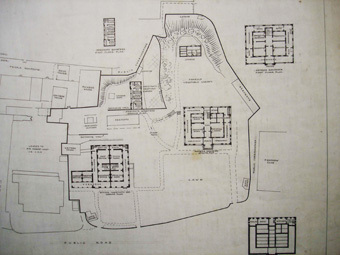 They aimed for compounds of a few acres that could be walled around, and could include single-storey offices, local staff quarters and outbuildings. Crossman was surprised in 1866 at Kiukiang, where he had been told that there was no consular house, to find that a large house and constable’s quarter had already been built on the bund in the concession area. It had apparently been funded by the unauthorised sale of a concession lot. The same happened at Hankow, where an over-large consul’s house had been designed and supervised by a private architect, Mr Morrison, in 1864. The new assistant’s house, though, was so badly sited that it regularly and deeply flooded and had later to be rebuilt. When Crossman visited Ningpo, a two-storey consulate, designed by the surveyor general in Hong Kong, Wilberforce Wilson, Cleverly’s successor, was already under construction on the bank of the river in an excellent 1½ acre compound opposite the town: Crossman instructed that piles should be driven for a second house in case trade increased (which it never did). But some offices and a constable’s quarter with a lock-up were built here a few years later. Crossman designed several consulates during his first tour. A vice-consulate was first established at Whampoa, about 12 miles downstream from Canton, in 1843. It was necessary on account of large vessels anchoring there because the stone defensive barriers that the Chinese had built across the river during the First Opium War blocked their passage to Canton. The vice-consulate was at first housed in a small boat, then in an old navy store-ship, the Alligator, before the consul moved onshore in 1865 and required a building. Crossman’s was built three years later on hilly ground known as Ping Kong, in the sub-district of Kiao Tang. At Foochow, about two acres of unoccupied hill garden on Nantai island, which became the foreign settlement, were leased in 1860 from the village elders. Here Crossman designed a consul’s residence, assistant’s house, offices and courtroom that were completed by 1869. A consular post was established in Tientsin in 1860, with little difficulty because British troops were still stationed in the city. The British concession, of about 64 acres, was selected by Parkes and acquired in 1861 (and twice later enlarged). A two acre compound, at the north end of the concession area and fronting on the Bund , was bought in 1868 from the bankrupt Messrs Dent and Company. Crossman converted the Dent godown, or warehouse, for the consul’s residence and offices. The building was later extended and several lesser buildings on the site were replaced with assistants’ quarters, office and constable’s quarters in 1896. Crossman was deeply involved with the Shanghai consular compound. In 1865, when 4,000 Britons were recorded as living in the city, a Supreme Court for China was established there to obviate cases being sent to Hong Kong for trial. Soon after his arrival in 1866, Crossman proposed meeting the requirement for a large new courtroom by building it as an extension to the north side of the 1849 consul’s residence. The project also involved the consul moving into one of the two original vice-consular houses so that the space that he vacated could be adapted to provide offices for both the consulate and the Supreme Court. This major project was completed in 1869, and was immediately followed by a start on construction of a new consul’s residence at the north corner of the compound. 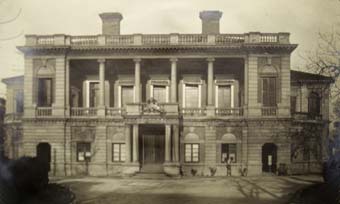 Little over one year later, on 24 December 1870, the combined consulate/Supreme Court building was destroyed by fire. The staff moved first into temporary rented accommodation off-compound and then into temporary offices and courtroom built by Boyce on-compound. There was a long argument about whether to rebuild the combined building (as Boyce and the judge argued) or to build a separate new Supreme Court and combine the residence and consular offices in a separate new consular building (as the minister in Peking and the acting consul argued). London came down on Boyce’s side, not least because it would be significantly cheaper to re-use the existing foundations. The almost completed new consul’s residence escaped the fire and was first occupied in 1871. The rebuilding of the combined offices and Court was completed in 1873. 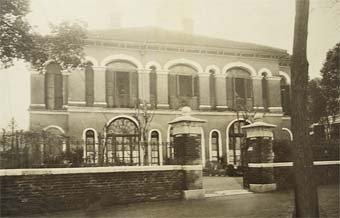 The Shanghai consulate was upgraded to a consulate-general in 1884. Other buildings were completed over the next twenty years, such that by 1899 the accommodation in the compound, besides the offices/Court building and the residence, included residences for a consul, assistant judge, two vice-consuls, a married assistant, two bachelor assistants, chief clerk to the court, the Office of Works surveyor, as well as compradore’s quarters, sailors’ waiting room, gate lodges, stables and other ancillary buildings; a fine great lawn; and a tall flagstaff. The chief justice always lived off-compound. Boyce was much pre-occupied with the building and rebuilding works in Shanghai for the first several years that he was in charge of the office after Crossman’s departure in 1869. But Shanghai was far from his only focus. 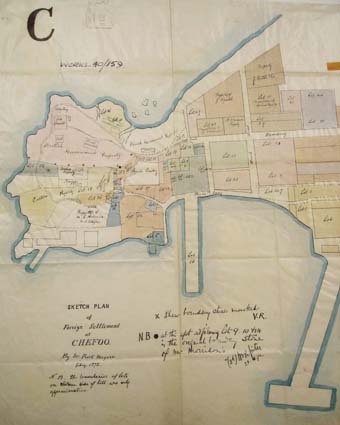 In Chefoo, various plots had been bought from local Chinese owners during 1864-67 to create a compound of about eight acres, later walled around, in the north east corner of the headland immediately north of the old town. Boyce completed bungalows for the consul and assistant, offices, and constable’s quarter in 1870. A vice-consulate was established at Pagoda Island, ten miles downstream of Foochow, in 1867 to deal with shipping that required a deeper anchorage than was available at Foochow. The anchorage lay in a bend of the river, beneath a high bluff and close to an island capped with a seven storey stone pagoda. The consulate’s first accommodation was on the island in a bungalow between the pagoda and a small fort. 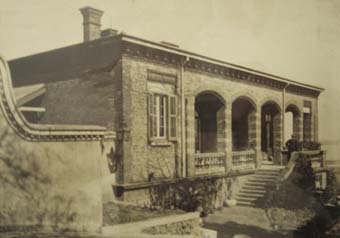 Two years later, a site was bought on the crest of the nearby bluff, known as Yentai or Mawei, and here Boyce completed a vice-consular bungalow, office and constable’s quarters in 1872. By 1870, the whole consular operation in China was so expensive for the government and so necessary for the merchants that Parliament was forced to take a close interest. There were endless debates, especially in Parliamentary Committees, about whether this or that consulate should be opened, closed, upgraded to consulate-general, downgraded to vice-consulate, or its staff reduced or supplemented. This uncertainty created enormous problems for the programming and funding of new buildings, and was the chief reason for extensive delays. The concession area at Chinkiang, selected by Parkes in 1861 and divided by him into 19 lots, lay along about 500 yards of bund on the south bank of the Yangtze. Although Parkes also reserved a walled and wooded site of 2¾ acres on a hillside immediately south-west of the concession area for the British consulate, it was initially housed in part of a Buddhist temple nearby. It was not until 1871 that funds became available to build permanent accommodation. 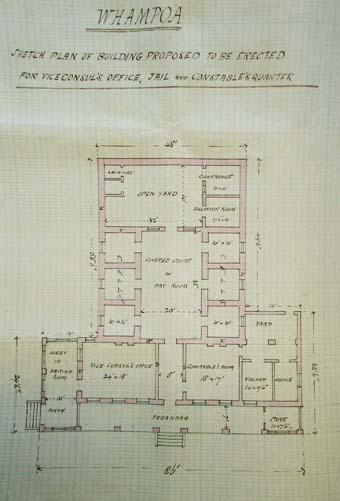 Boyce was therefore able to complete a two-storey consul’s house and a constable’s quarter on Parkes’s site in 1873. The slope of the site was sufficient for the living quarters to be above the offices, with their separate entries on different levels. Newchwang, in the north and 40 miles up the Liao river, was closed by ice in the winter months. The first consul there, Thomas Meadows, therefore selected in 1861 a more accessible riverfront concession area only 13 miles up the river and laid out nine lots and a consular site along the river bank. This proved a lamentably bad selection of site because the bank was subject to severe erosion. The consular site was washed away within a few years, and the whole intended concession area had gone by 1900. Meadows and his successors were therefore forced to spend the 1860s in primitive leased accommodation in a temple just behind the Customs premises. Both Crossman and Boyce, on separate visits in the late 1860s, condemned this accommodation and Boyce drew up a scheme for new consulate buildings nearby. London, however, refused to authorise funding because the future of the Newchwang consulate was in doubt. In the event, it was endorsed and in1873 a four acre site, between the Roman Catholic Mission and the Russo-Chinese Bank, was bought from Messrs. Knight and Co., complete with a house built in 1863. Boyce extended and improved the house, built accommodation for the assistant and constable, and converted some old buildings to stables and a courtroom: all of the buildings were of single storey. The residence conversion proved unsuccessful and a new residence was built in the compound a few years later. By a perpetual lease agreed in 1867, the grounds of an old Spanish and later Dutch fort at Tamsui, reputed to have first been built in 1629, were conveyed to the consul. They comprised 2½ acres on the bluff that looks to both the river mouth and the town. The small fort itself made a good constable’s quarter and gaol. It was extended to house offices in 1877, concurrently with the construction of a vice-consul’s bungalow, designed by Boyce. This bungalow needed serious attention by 1890, and was extensively rebuilt, with an added storey, the following year. 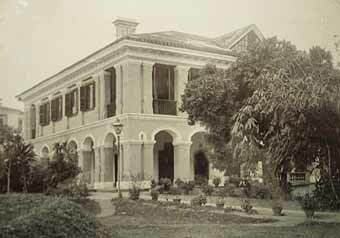 The consul’s house at Amoy, which had two storeys when bought in 1862, suffered severe typhoon damage in 1873. Boyce removed the upper floor, added a couple of bedrooms to the ground floor, and replaced with solid brickwork the old veranda that he described as ‘perhaps the largest in China and the worst constructed’. Boyce was concurrently working on a 1¾ acre site, adjacent to the Lin Tao jetty on Kulangso, that was bought in 1869, with an additional piece in 1872, for new offices. Here he built single storey offices, a two storey courthouse, and a constable’s quarter with cells. The concession area at Kiukiang, negotiated by Harry Parkes in 1861 on the bank of the Yangtze River and just outside the city walls. The consulate site is on the Bund, and marked pink. 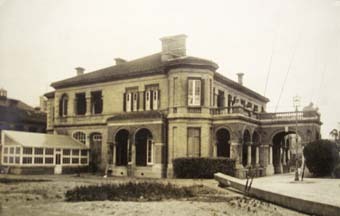 The consul’s house at Kiukiang, seen from the Bund in about 1911. 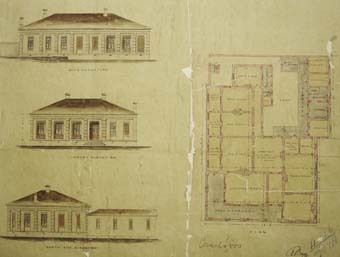 Major Crossman’s 1867 sketch for offices and gaol at Whampoa. Foochow consular compound, laid out by Crossman in 1867. Offices and assistant’s quarter at Foochow, built 1869. 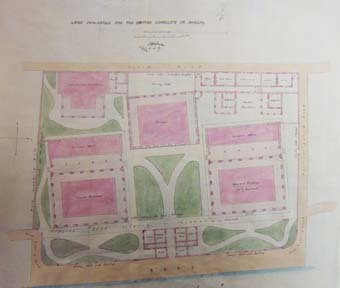 Wilberforce Wilson’s 1864 layout for the consular compound on the Bund at Ningpo. Consul’s residence and an office/assistants’ quarters building flank a gatehouse, with a prison block directly opposite and interpreter’s and constable’s quarters at the rear. 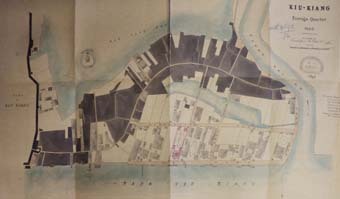 Plan of the British Settlement at Tientsin in 1865, on the Bund between the American and French settlements. Buildings marked in pink. The large one near the bottom-right corner was bought in 1868 for the consulate, and converted into the consul’s residence and offices by Crossman. 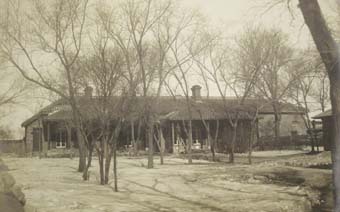 The consul’s residence and offices at Tientsin about 1910. Main frontage of the Supreme Court in the consular compound at Shanghai. Behind the court rooms are the offices of both the Consulate and the Supreme Court. The building dates from 1871-3, when it was rebuilt by Robert Boyce after the fire of 1870. The consul’s residence at Shanghai, which faces the offices/court building. It was completed in 1871 by Robert Boyce. The consul’s residence at Chefoo, designed by Boyce in 1870. 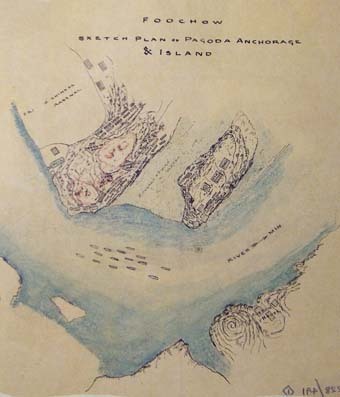 An 1870 sketch of the Pagoda Island anchorage. Boyce built a bungalow for the vice-consul on the bluff at left in 1872. Boyce’s bungalow opposite Pagoda Island. Consul’s house and offices, built 1873, on the hill over-looking the Chinkiang concession area. The consul’s residence at Newchwang. 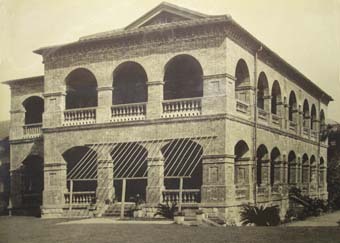 The consulate house in the grounds of the fort at Tamsui on Taiwan in about 1910. It was built in 1877 to Boyce’s plans as a single storey: another was added in 1891.